German Formula One driver Sebastian Vettel of Ferrari claimed the outright lead of the Formula One championship by winning a tense Bahrain Grand Prix, despite a late charge from Lewis Hamilton. In a race which saw pole-sitter Valtteri Bottas, Vettel and Hamilton all lead at different stages of the race, Ferrari's decision to pit early ultimately won it, as did a Safety Car period which forced Mercedes to double stack its drivers at the pit stop, reported ESPN. It was at that moment Hamilton made the crucial mistake, holding up Daniel Ricciardo on entry to the pit lane and earning a five-second penalty, meaning he had to sit stationary at his final stop, it stated. He was never challenged out in front at the end but Hamilton's pace set up a grandstand finish as he dramatically cut the gap, helped by teammate Bottas moving over to concede second in the first stint, the report added. 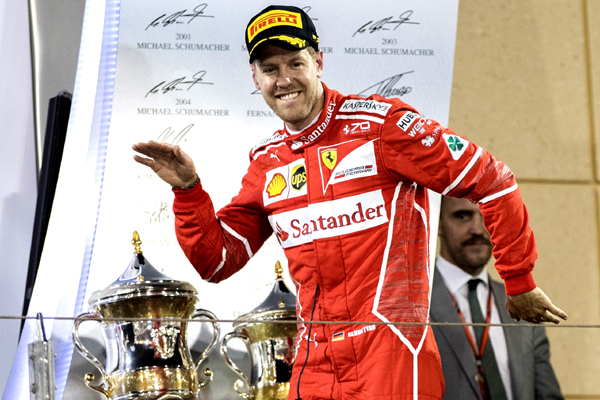 It was Vettel’s third victory in Bahrain and the 44th of his career, a signal that Ferrari not only have a fast and competitive car again, but also that the team has rediscovered its confidence. The German star now leads the title race with 68 points ahead of Hamilton on 61. Vettel came from third on the grid in qualifying to first place in the early laps of the race, according to SB Nation. He held off a late charge from Hamilton of Mercedes, and he outraced Valtteri Bottas from beginning to end to take the race. Hamilton found himself finishing in second, with Bottas, the pole-sitter for the race, taking the third podium spot. There was some pit stop incongruity between the top finishers, but ultimately Vettel ran a quick race and was stuck to the back of Bottas before any pits were taken. The Ferrari garage took the first big chance of the race when Vettel went in for an early pit on Lap 11, said the report. Vettel, to that point, had stuck his car right behind Bottas and wasn’t letting him create any separation. Vettel came out in 12th place, and on the next lap, Verstappen of Red Bull came over the radio and said that his team needed to do something, so they pitted him, it stated. Unfortunately, Verstappen came out of the pit and immediately suffered a brake failure around Turn 4, going off and into the wall, ending his promising race. Kimi Raikkonen of Ferrari suffered through a slow pit stop and came out in 10th place, it added.